This week i’m sharing this super colorful and healthy meal. 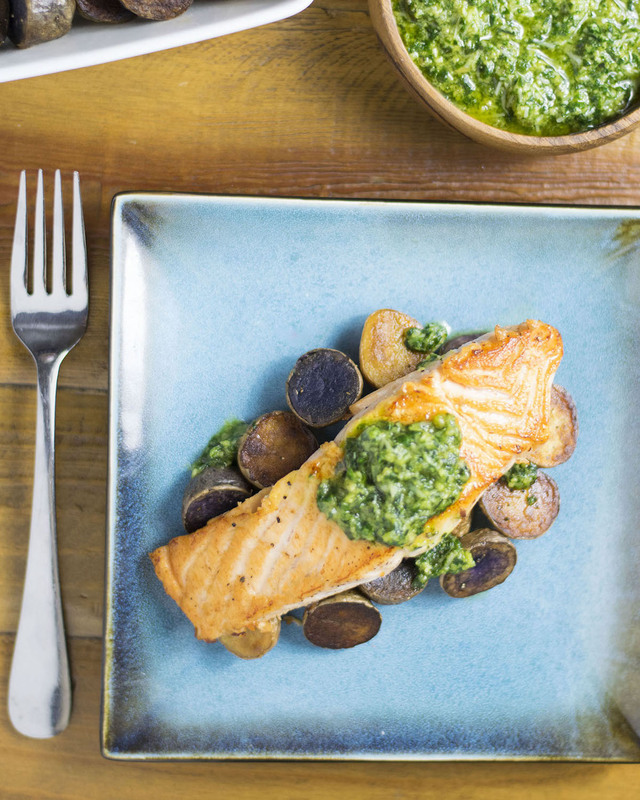 The pan seared salmon over the mini roasted potatoes, topped with the pesto is just yummy! Best of all you can easily pull it off in under an hour, any night of the week. You can even make the pesto ahead of time! You will wow all of your hungry guests at the table with this restaurant quality dish, made in no time! Cut the potatoes in half and place in a bowl and drizzle with the olive oil and top with salt and pepper. Transfer to a baking sheet and roast until crunch on the outside and tender on the inside, about 30-40 minutes. Season both pieces of salmon with salt and pepper. In a small frying pan heat up the olive oil. Pan sear each piece of salmon for 3-5 minutes per side. Cool Tip: if your salmon is nicely seared but isn't fully cooked in the inside. Just pop it in microwave for 15-30 seconds! Combine the basil, garlic, and pine nuts in a food processor and pulse until coarsely chopped. Add 1/2 cup of the oil and process until fully incorporated and smooth. Season with salt, pepper, and red pepper flakes. Transfer the pesto to a large serving bowl and mix in the cheese. I made this and it was very yummy!